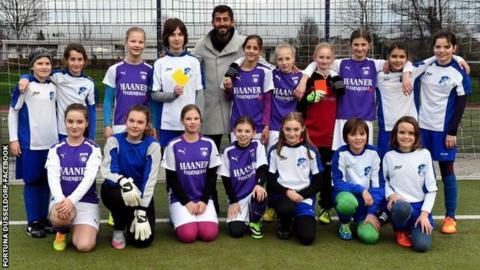 A Fortuna Dusseldorf midfielder was made to referee a junior league girls' game as punishment for insulting a female referee. Kerem Demirbay was given a second yellow card in his side's Bundesliga 2 match against FSV Frankfurt last week. Demirbay reportedly told female referee Bibi Steinhaus women have no place in football while leaving the pitch. "This is what happens when young players make mistakes," Fortuna said on Facebook. Turkish youth international Demirbay, who was made to referee the girls' game by his club, is still awaiting sanction by the German FA for his comments but has repeatedly apologised. "I am extremely sorry for having said what I did to Ms Steinhaus," Demirbay said earlier this week. "I should never have said this sentence and it does not reflect my image of women."